Emergency Medical Kits - innovints Webseite! The Emergency Medical Kit PNR 6240-28 has been assembled strictly to the statutory requirements of FAR 121, Subpart X and ICAO, Part I including latest amendment. The emergency medical kit represents the minimum mandatory Standard. The upper compartment is equipped with an ampoule rack which holds up to 33 ampoules. The lower compartment is divided into sections grouping the items by medical subject. The kit is manufactured of aluminum sheets (coated in grey) and aluminum sections. Innovint can provide a compliance Analysis. 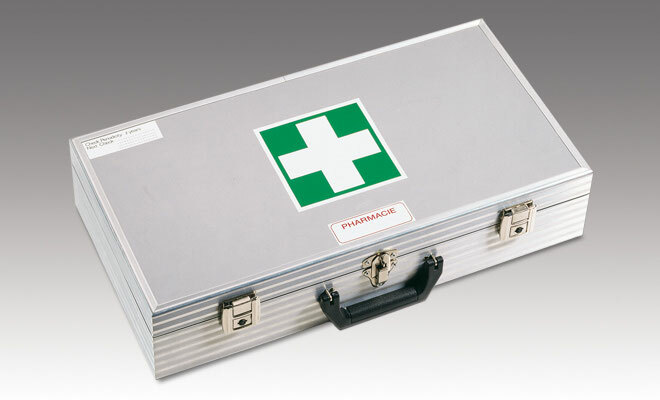 The Emergency Medical Kit PNR 6240-22/-62 has been assembled to the statutory requirements of EASA AIR-OPS. In addition the kit covers FAR 121, subpart X and ICAO, part I as well. The lower compartment is divided into sections grouping the items by medical subject. The kit is manufactured of aluminum sheets (coated in gery) and aluminum sections. Anticipated shelf life is 12 months, which may be reduced down to 9 months due to the availability of medicine production lots. Latches can be sealed by tie-wraps, plombs or lockers.